An electronic newsletter. What a deal. Sign up now and see what you get. Free. The form is at the bottom here. With Ellen Hart I'll be entertaining guests at Once Upon A Crime on the evening of November 18. There'll be wine and noshes. The occasion is the release of my fourth sailing adventure. 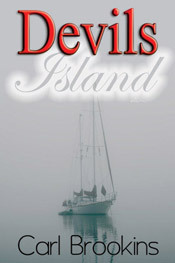 This one, DEVILS ISLAND, is set in the Apostle Islands of Lake Superior. Mary Whitney has to try to fend off the unwelcome attention of her ex-husband who has sunk even farther into murderous rage at Mary. She'll need every bit of mental toughness along with physical agility and stamina to survive this situation and save her boat as well. "When Annie Archer turns up at Minneapolis's Xanadu Club, its owner, lesbian restauranteur and amateur sleuth, Jane Lawless, offers her a job and takes on the task of finding Annie's long-missing father. Verdict: The Lambda Literary Award- and Minnesota Book Award-winning author of 16 Jane Lawless mysteries knows how to spin a tale full of complex plot lines, fast-paced action, and characters skilled in deception. Fans...will not be disappointed." Embroidered Truths by Monica Ferris from Berkley Prime Crime: It's another needlecraft mystery. Betsy Devonshire takes in her employee, Godwin after he has a nasty quarrel with John. When John is found to be no longer among the living, Betsy has to leave her small shop to others while she sleuths out the tangled circumstances of a surprising life. In that nest lies the answer to the question, who murdered John? Trick or Treat, by Kerry Greenwood from Poisoned Pen Press: In the Corina Chapman series. Earthly Delights, Corina's bakery is under siege. A cut-ratecompetitor shows up, new regs and old lovers add to the growing cast of murky strangeness. Will Corina sort it out and be triumphant? Need you ask? Chinese Whispers, sixth in Peter May's China thriller series. The Beijing Ripper makes an appearance and may turn out to be Li Yan's deadliest foe. Meanwhile things are still complicated in the on-going love relationship between the cop, Li Yan and American forensic pathologist, Margaret Campbell. Morgan Mandell has checked in with an interesting story that examines the pressures of conflicting career choices. In Killer Career, Julie McGuire has a hot career going as a lawyer in Chicago. She's attracted to her law partner, although she's in denial about that. Along comes a hot author of the thriller-chiller variety—and that's just the way he looks at Julie. She wants a writing career in the worst way but hooking up with Tyler Jensen may indeed be the worst way.